You know you have too much time on your hands when you can create something as stupendously silly and ridiculous and wonderful as the following video. If you can’t laugh about it, then you have no sense of humor. That is all. You have to admit, you wish it was longer, don’t you? 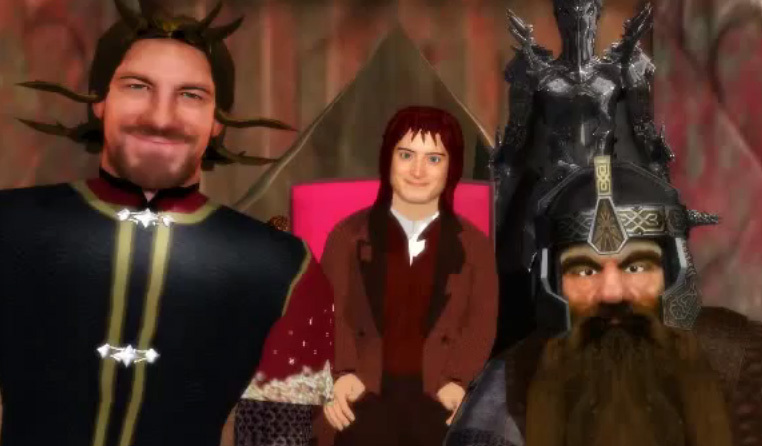 And I’m not sure what they were trying to do with Boromir and his hair (plus facial expression), but I like it! Thanks to Geeksaresexy.com for head’s up. Which one of the Fellowship would you spend a day with? You get a day with one of the Fellowship members. Who would it be? Would it be Frodo, the ringbearer, who would probably tell you tales of his journey with wide eyes? Or Samwise the brave, who would tell you his secrets of growing the best vegetables? Would it be Legolas, the elf, who awe you with his beautiful shiny blond hair and skills with blades and arrows? Or Gimli, who would challenge you to a drinking duel and laugh as you pass out? How about Gandalf, who would speak to you about better days to come? Pippin, who’d laugh and dance and sing with you? Merry, who would probably do whatever you want? Or Boromir, who would talk of victories won? Or would you like to spend a day with the King and see what life is like in royalty?